Importance of Informed consent !! 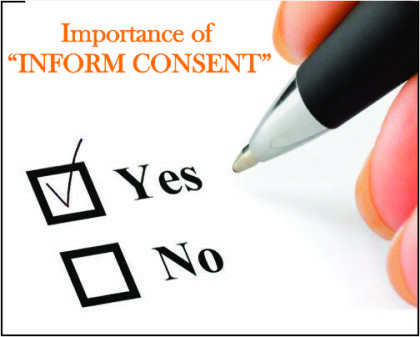 “Informed Consent” in Medical Treatment is of Utmost Importance, !!!! (i) A doctor has to seek and secure the consent of the patient before commencing a “treatment” (the term “treatment” includes surgery also). The consent so obtained should be real and valid, which means that : the patient should have the capacity and competence to consent; his consent should be voluntary; and his consent should be on the basis of adequate information concerning the nature of the treatment procedure, so that he knows what is consenting to. (d) adverse consequences of refusing treatment. But there is no need to explain remote or theoretical risks involved, which may frighten or confuse a patient and result in refusal of consent for the necessary treatment. Similarly, there is no need to explain the remote or theoretical risks of refusal to take treatment which may persuade a patient to undergo a fanciful or unnecessary treatment. A balance should be achieved between the need for disclosing necessary and adequate information and at the same time avoid the possibility of the patient being deterred from agreeing to a necessary treatment or offering to undergo an unnecessary treatment. (iii) Consent given only for a diagnostic procedure, cannot be considered as consent for therapeutic treatment. Consent given for a specific treatment procedure will not be valid for conducting some other treatment procedure. 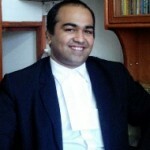 The fact that the unauthorized (http://JUDIS.NIC.IN SUPREME COURT OF INDIA Page 16 of 25) additional surgery is beneficial to the patient, or that it would save considerable time and expense to the patient, or would relieve the patient from pain and suffering in future, are not grounds of defence in an action in tort for negligence or assault and battery. The only exception to this rule is where the additional procedure though unauthorized, is necessary in order to save the life or preserve the health of the patient and it would be unreasonable to delay such unauthorized procedure until patient regains consciousness and takes a decision. (iv) There can be a common consent for diagnostic and operative procedures where they are contemplated. There can also be a common consent for a particular surgical procedure and an additional or further procedure that may become necessary during the course of surgery. (v) The nature and extent of information to be furnished by the doctor to the patient to secure the consent need not be of the stringent and high degree mentioned in Canterbury but should be of the extent which is accepted as normal and proper by a body of medical men skilled and experienced in the particular field. It will depend upon the physical and mental condition of the patient, the nature of treatment, and the risk and consequences attached to the treatment. 0 comment(s) on Importance of Informed consent ! !